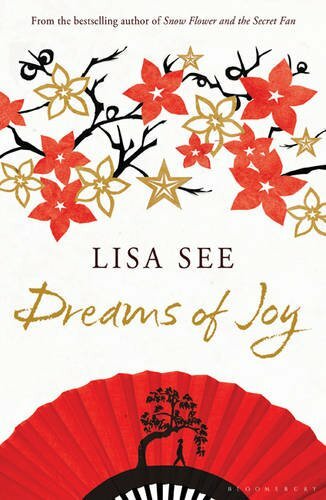 Dreams of Joy is the sequel to Lisa See’s Shanghai Girls which I read in October. When I reached the end of Shanghai Girls and found that it finished with a big cliffhanger, I was desperate to find out what happened next. Luckily my library had a copy of the sequel available so I didn’t have long to wait. And this one, in my opinion, is the better of the two books. It certainly has a more satisfying ending! It’s difficult to know how much to say about the plot of a sequel because I know there may be people reading this who haven’t yet read Shanghai Girls and I would hate to spoil things for anyone. All I will tell you then is that Dreams of Joy is set in China during the 1950s and is the story of nineteen-year-old Joy Louie, the daughter of one of the characters in the previous novel. Joy has recently made a discovery that has thrown her life into turmoil and she decides to leave her home in Los Angeles and travel to Shanghai in search of answers. She’s also looking forward to becoming part of Chairman Mao’s new communist China…but the longer she spends there the more she begins to think that maybe communism isn’t quite as wonderful as it seemed at first. The story is told in the form of alternating narratives by Joy and another character from Shanghai Girls, Pearl. Although I didn’t think there was a lot of difference in the style of Pearl’s narrative voice and Joy’s, there are some big differences in attitude with Pearl being more cautious and cynical about communism and Joy full of enthusiasm, at least at first. It was good to have the chance to see things from two opposing viewpoints. Joy could be frustratingly naïve at times, but that’s only because we have the benefit of knowing what would happen during Mao’s regime. The only other book I’ve read about communism in China was Wild Swans by Jung Chang (one of the best books I read last year, by the way, and one I highly recommend you read if you haven’t already). I had forgotten just how horrible some of the things that happened during Mao’s Cultural Revolution and Great Leap Forward were. The Great Leap Forward included Mao’s campaign to increase the country’s steel production, at the expense of agriculture, which resulted in a severe famine. Lisa See goes into quite a lot of detail about what happened during this period, so there are some horrific descriptions of cruelty, starvation and suffering, particularly in the sections where Joy is living in Green Dragon Village, a commune in the countryside. Lisa See really likes to put her characters through some terrible ordeals, but the book isn’t completely bleak and depressing – it’s also a story about the relationship between sisters Pearl and May and the special bond each of them has with Joy. So is it necessary to have read Shanghai Girls first? I would say it’s not completely essential, as I’m sure this book could easily be understood and enjoyed on its own, but my personal recommendation would be to read both of them in the correct order beginning with Shanghai Girls. I haven’t read any Lisa See since Snow Flower and the Secret Fan which I thoroughly enjoyed. I must remedy that soon! This sounds interesting but I’m not sure how I feel about books that end on a cliffhanger. Somehow they always leave me feeling cheated. I gave up reading Janet Evanovich’s books for that reason.